Want to know how to make water heaters more efficient and capable to deliver hot water faster? With water heater boosters improving the water heating process is much easier than before. Water heaters are excellent devices that produce hot water efficiently and deliver it faster to the fixture. However, the energy consumption of a water heater alone is great while the delivery rate could be slower, which makes it a little expensive and inefficient, especially in large homes and distant sinks. That’s why water heater boosters exist, to speed up delivery and provide energy improvement that saves you money and water. What Is a water heater booster exactly? Water heater boosters are devices that help water heating units to improve their capacity, energy efficiency, and pressure. They also help to improve temperature and provide a boost in the process of heating the water, most helpful in places where faster hot water comes handy. These devices are installed over the water heater, especially the ones with tanks. They improve the flow of water in the heater and enhance the process of heating while providing better pressure. This eventually delivers instant hot water, while maintaining temperature for longer. But the real purpose of having a water heater booster is to provide a boost in water temperature. Not only this device helps to improve pressure and capacity, but it also helps to make the water hotter. Most water heaters can only provide up to 140ºF (60ºC) and much less when they work deficiently, but with a booster, they can go up to 180ºF (82ºC) without problems. This makes water heater boosters much more useful and advantageous for a wide variety of applications. This tells you how energy efficient the product will be, how fast it will heat up water, and how much temperature it will offer. Standard power measures are between 25 to 30 AMPs, anything less than that is just too little, and anything higher is just too much. Another feature that matters when it comes to energy, how many KW the product needs to work. If it consumes more than 8 KW, the product is just not efficient in any way. Go for something at 7.2 kW if you want a much better device. The GPM is how much water flow the device needs to turn on. Most heater boosters use 0.3 GPM to start working. Something higher will be a lot slower to work, and a lower measure will simply be too fast. Essential to know if it fits your water heater, the connections or inlets in the device have to be precisely like the outlets on the water heater. Most common devices use ¾ inches piping, while others may be ½ inches. Choose something that goes according to what you have at home. Being technological devices, heater boosters also provide several modes that help users increase their effectiveness or use them more conveniently. These modes include configurations to make them more energy-efficient, faster or more responsive. Other features such as the size and weight may also have a significant impact on how well it fits your needs. So you must also consider them when buying. Are water heater boosters for you? Water heater boosters will improve your hot water pressure while increasing the temperature. This means more risk of scalding and accidents. They use less energy than water heaters, but they only work when attached to a water heater. This means more energy consumption in the long run as both devices will work together. Despite being small devices that fit practically any water heater, they are often pretty expensive. This makes them only useful if you need the improvement in temperature and pressure. They are much easier to install than a water heater. But installation still needs to be done by a professional to avoid potential dangers and damage to the product. By setting up a desired temperature on the device, a booster helps to deposit water in tanks without having to use it until it is adequately heated. Water in tanks typically get up to 140ºF and then is delivered. With a booster, this water will be stored for longer and used more efficiently as soon as it gets to a suitable temperature. Despite being frequently used to increase temperature and pressure, water boosters can also be used to prevent accidents by slowing down pressure and making sure temperature does not pass healthy ranges. High temperatures over 140ºF (60ºC) can burn skin in just five seconds, but with a booster, you can make sure water never reaches that point. Water heaters store water at temperatures below 120ºF (45ºC) in their tanks, which makes them the perfect place for bacteria to reproduce. Using a water heater booster allows users to store water at much higher temperature measures which prevent the creation of bacteria and collection of other harmful contaminants. Highly efficient hot water booster that provides up to 45% more hot water capacity, the EcoSmart SmartBoost is also really easy to use and reliable. It consumes only 7.2 kW and needs 30 AMPs to work. It only fits ½ inches pipes. 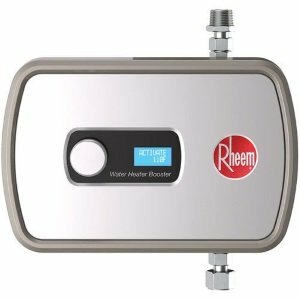 Capable of delivering a 45% improvement in water capacity and more energy efficiency, the Rheem RTEX is a compact and very efficient device. It fits all ¾ inches pipes and only needs 7.2 kW and 30 AMPs for proper functioning. It comes with advantageous modes that save energy and water. Designed to deliver much more water than a standard water heater, the Eemax AutoBooster is a digital device that provides a completely customizable experience. It comes with easy controls, better temperature accuracy, and a pretty compact design. Installation is one of the easiest as well. Need to improve your water heater efficiency? Don’t let your water heater to deprive your needs of hot water. Use water heater boosters and you will receive hot water faster, with more pressure, and a lot warmer than average. Improve your water heating process with one of these devices and you will simply get the best results. Get a booster for your water heaters and forget about cold water and slow pressure, it will improve your water efficiency amazingly! Water heater boosters are the only devices that provide a boost in both pressure and temperature in warm water. Using them will make hot water available in no time!